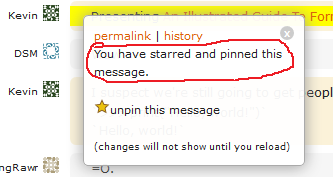 In the Python chat room, we have a message that we like to keep pinned, because it is a useful reference for new users that are unfamiliar with the markup system. An RO pinned the message, and it stayed on the sidebar star list for a few days before falling off automatically, as expected. Another RO pinned it again, and the same thing happened. So far so good. Here is the problem: I tried to pin the message a third time. The interface indicates that it was pinned successfully. But the message is not on the star list. I've confirmed that this is not just a problem on my end. Other ROs are also unable to pin the message, and both ROs and ordinary users are unable to see the message in the star list. Is this a bug? Or is it by design that a message can't be pinned arbitrarily many times? Is there a workaround? Browse other questions tagged bug chat chat-stars . All of someone else's stars in chat?